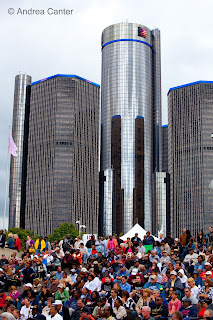 It was my 5th consecutive Labor Day Weekend at the Detroit International Jazz Festival. Emphasis on “Detroit,” please. One of the nation’s most depressed urban centers, every Labor Day Weekend, Detroit somehow comes alive with civic pride, boastful of a long tradition of American music including bebop and beyond and a multi-cultural, cross-generational, economics-be-damned celebration that draws musicians and fans from well beyond the Midwest. This year, the draw was bigger than ever, both in terms of the cachet of the artists and the size of the crowd that descended upon downtown’s Hart Plaza and Camp Maritius like a human tidal wave. 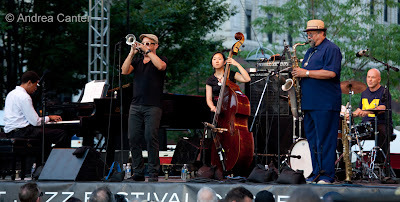 Why so much hoopla about jazz in Detroit? This is the world’s largest free jazz festival, with attendance likely approaching a million this year. There are no tickets, no admission, no reservations. Sure, you can donate $100 or more and get VIP seating at every stage. But VIP seating, if the best in the “house,” is but a fraction of the seating. And I use the term “seating” loosely. There are folding chairs and bleachers at the Chase/JP Morgan Main Stage and Mack Avenue Riverfront Stage. There are cement tiers at the Carhartt Amphitheater and Pyramid Stage. And many bring their own chairs, which often end up lined around the peripheries of each venue. Sooner or later (sooner, this year), there’s a phalanx of standees, some times many rows deep. Contributing to even larger crowds this year, the weather was as perfect as it gets in late summer. The line-up was as fantastic and frustrating as it gets at a jazz festival, with headliners like Sonny Rollins, Wayne Shorter, Pat Metheny, Chick Corea & Gary Burton, Wynton Marsalis, Terence Blanchard, Joe Lovano & Dave Douglas, Kenny Garrett, Kevin Eubanks, Lew Tabackin & Randy Brecker, and the Preservation Hall Jazz Band all pulling at our ears, sometimes concurrently. 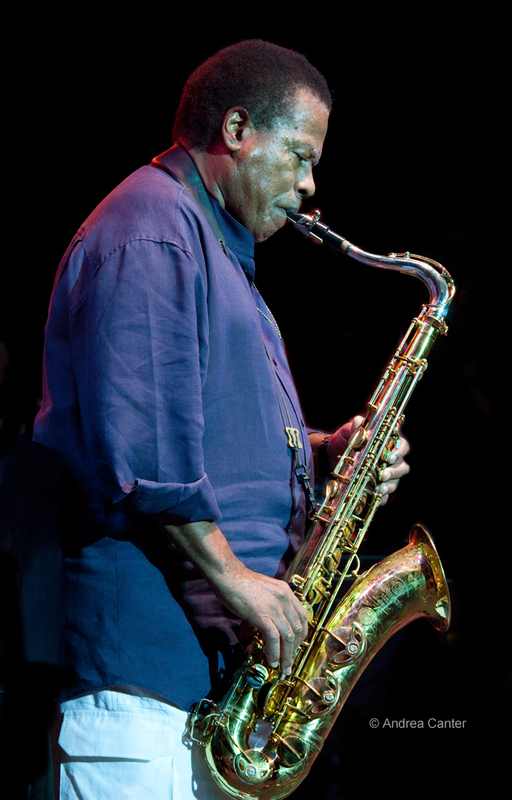 And take away the those “big names” and the list of bright rising stars and seasoned, under-appreciated veterans would have sufficed – Fred Hersch, Curtis Fuller, Louis Hayes, Marcus Belgrave, Gregoire Maret, Gerald Cleaver, Tia Fuller, Ellery Eskelin, David Binney, Charles McPherson & Tom Harrell, Judi Silvano, Alfredo Rodriguez, Geoffrey Keezer & Donny McCaslin, Rick Margitza….Mack Avenue All-Stars including Fuller, Garrett, Rodriquez, Eubanks, Sean Jones, Aaron Diehl… “sidemen” John Patitucci, Brian Blade, Craig Taborn, Tony Malaby, Linda Oh, Francisco Mela, Joey Baron, Ray Drummond, Kobie Watkins, Johnathan Blake, J.D. Allen…. 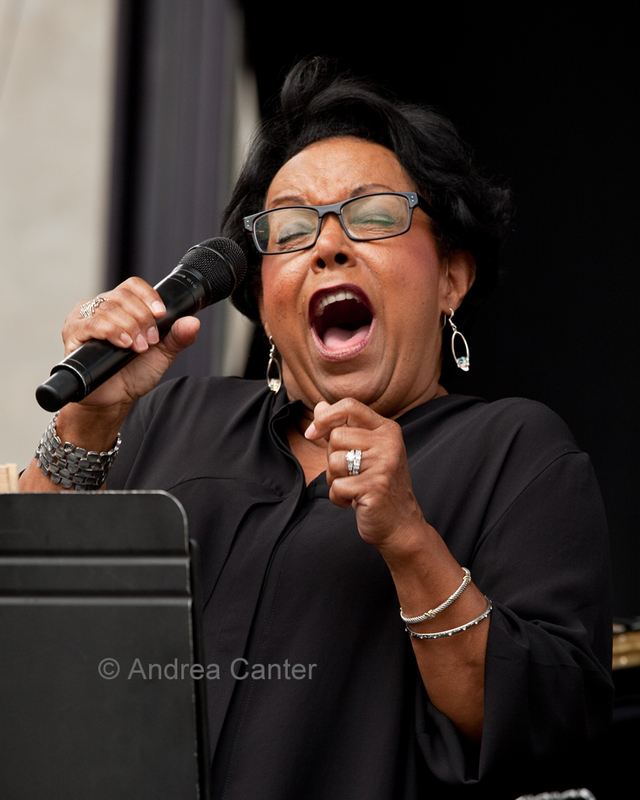 Veteran Detroiters like singer Ursula Walker and saxman George “Sax” Benson who should be well known coast to coast; young upstarts like Monk Competition winning-vocalist Cécile McLorin Salvant and pianist Lawrence Fields. The Detroit Jazz Festival is not for the faint of heart or hard of hearing. Geographically, it only covers about 5 city blocks from the north side of Camp Maritius and the Chase Main Stage down Woodward Av to the three stages of Hart Plaza and the river front. There’s enough parking, it seems, with at least three giant ramps/garages within a couple blocks. But you’re faced with strategic dilemmas from noon til after dark, save opening night which offers only the main stage headliners. You need to plan with care or you will find yourself on the outer edges, hearing music you can’t see except (maybe) on the projection screen high above the stage. 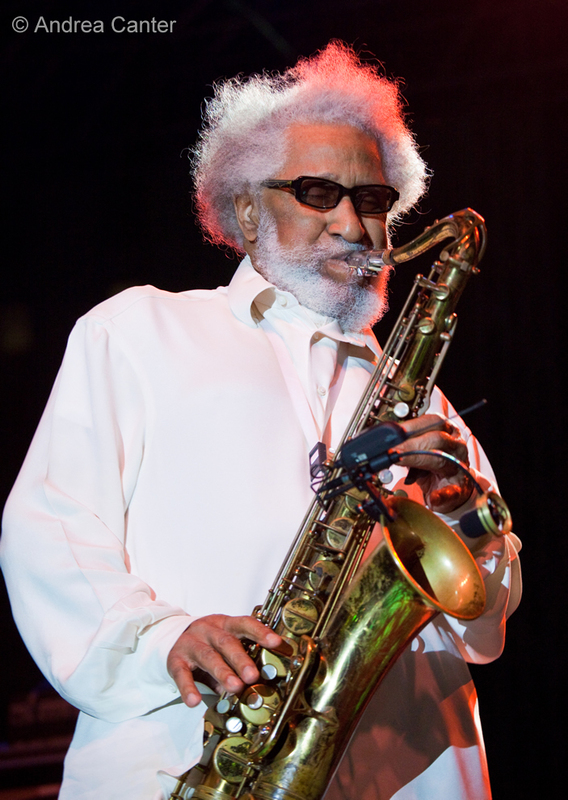 Still, even on the fringes of Camp Maritius (so named for a 19th century, city square sculpture of Mars, God of War), to be in at least the aural presence of Sonny Rollins… it’s not a bad way to start the weekend. And for the three days following the opening night gala gigs, it seemed like the entire world was in Detroit, that jazz was the only music. Even the “smaller” acts of up-and-comers drew strong crowds; I never hit a sparsely attended set. Sometimes you could find seating pretty easily. More often you could only find seating by arriving early in the afternoon and staking out your own territory, hedging your bets at one stage while resigning yourself to the possibility of standing at the others. Vice President Biden’s entourage might have fallen victim to thievery on the streets of Detroit before his Labor Day rally; we’ve never lost chairs or coolers on Hart Plaza during jazzfest. The schedule was more tightly packed this year as the festival downsized from five to four stages, giving up the small student stage on Woodward while at the same time booking more acts—bigger acts—than ever, and still maintaining a strong schedule of student ensembles. 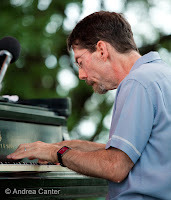 With start times closer together across the stages, there was more “sound bleeding,” especially between Carhartt—the big amphitheater that presents most of the big bands and biggest names—and the smaller Mack Avenue River Front Stage, where many of the smaller, often quieter, ensembles performed. If you were sitting or standing on the edges of either venue, there were times when your right ear strained to hear a piano trio while your left ear failed to block out sizzling trombones and trumpets. Despite the challenges (which also include finding food vendors that are not committed to grease and sugar), there is something almost sacred about the Detroit Jazz Festival—the determination of its leaders to keep it free and family-friendly; the commitment to reinforcing the jazz traditions of the city; the support of student musicians through presentation of college bands on the big stages with headliner guest artists and young artist competitions; the definition of jazz from trad to rad, including a nod to Motown (this is Detroit!) and gospel, but maintaining the focus on “jazz”; the support of new works through commissions. Perhaps a free urban festival with such high standards for the art guarantees logistical hassles. It also guarantees exposing thousands of children, student musicians, educators and fans at all levels of interest to a music that otherwise struggles for an audience; it brings revenue and positive attention to a city that badly needs both. For one weekend, Detroit is the jazz capital of the world and the only place I want to be. 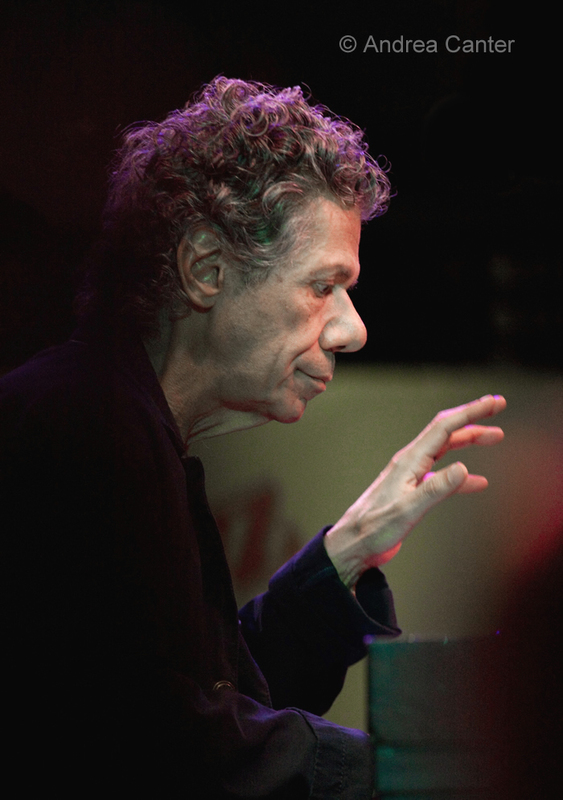 Even if I have to decide between Pat Metheny and Fred Hersch. Or between dinner and music. 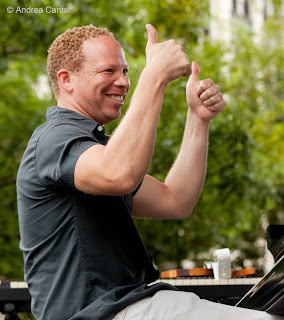 Craig Taborn (with Uncle June) gave the festival a big thumbs up!